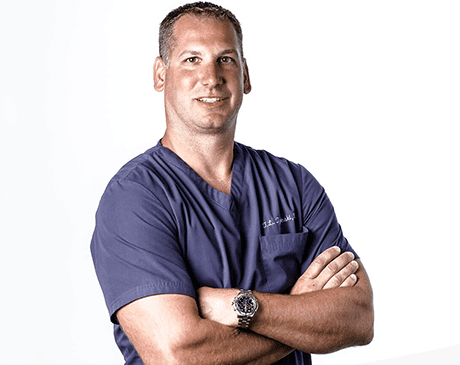 Todd Tyminski, DC, DAIPM, is a highly skilled and motivated chiropractor and the president of Peak Medical in Berkeley Heights, New Jersey. In addition to personally providing patients with superb health care, he also oversees the day-to-day operations of the practice to ensure that every patient achieves their health goals. Dr. Tyminski graduated with honors from Springfield College in Springfield, Massachusetts, with a bachelor’s degree in rehabilitation and a concentration in medical therapeutics. He won multiple awards in his undergraduate years, including Academic All-American, and he rounded out his scholarly pursuits with four years as a letterman of the football team. After Springfield, he relocated to Davenport, Iowa, to attend Palmer College of Chiropractic, where he earned a doctorate in chiropractic medicine. Dr. Tyminski’s chiropractic skillset is as deep as it is diverse. He’s a decompression specialist, a diplomate of the Academy of Integrative Pain Medicine, and he is board-certified in chiropractic care, physical therapy modalities, and manipulation under anesthesia. He’s also a member of the Association of New Jersey Chiropractors and the American Chiropractic Association. When he’s not helping patients, Dr. Tyminski coaches youth sports, cheers for the New York Giants, and likes to spend time with his wife, Jill, and their kids, Madison, Damian, and Cameron. He also enjoys the beach, camping, craft beer, riding ATVs, and working on do-it-yourself projects.